If you have ever been to an IT event or security conference you have undoubtedly seen many laptops with tape covering over their built-in cameras. The practice is becoming so common within some groups of people that you’ll occasionally even see the taped webcams in coffee shops and the workplace too. Interestingly enough, it’s not just your techy coworker or survivalist uncle who is taping over their webcams, it turns out the Director of the FBI does the exact same thing. If you’re unfamiliar with this, the idea behind placing tape over a computers built-in camera is a low-tech method of attempting to prevent potentially negative impacts of something called ‘camfecting‘, which is when a hacker or malware has taken over a persons webcam without their knowledge, and either takes pictures or watches the persons activity. This may sound a little paranoid and far fetched, but hackers have been targeting cameras for various nefarious purposes for many years, and some spy agencies apparently do too. So, the obvious question is, should you tape over your webcam? The answer likely depends on a variety of things; how concerned you are about a potential issue impacting you, your line of work, and what operating system software you use. If you are on an ancient Windows PC that hasn’t updated system software in 10 years and has installed every dodgy piece of junkware that comes your way and you see the webcam light flicker on and off constantly, then yes you may want to consider slapping some tape on the webcam to prevent someone snapping pictures of you with your knowledge. For Mac users, modern versions of OS X are much less of a target and have fewer attack vectors, and if you keep your system software and apps up to date as recommended, you’re even better off as potential holes are patched regularly. Is it still possible for Mac users with the latest and greatest OS X versions to be impacted by camfecting? Of course in theory, but there’s generally much less to worry about on the Mac side of things. With all that said, if your line of work exposes you to some unusual situations or makes you or your data extra valuable, or you’re into security operations, then sure, go ahead and throw some tape on your webcam and call it a day. There isn’t much commitment involved, and if it makes you feel more comfortable, the peace of mind may be worth the small piece of tape from a $2 roll. For Mac users who are genuinely concerned about this, another approach is through software, and you can always choose to disable the Mac camera completely by way of altering specific system components to prevent the built-in iSight camera from working completely – this is really only recommended for the most advanced users out there since it involves modifying system files, and with OS X 10.11 and later, disabling SIP in that process. I’ve even seen some extra dedicated security workers actually physically open their laptops to disconnect the built-in camera, a bit extreme but certainly gets the job done. Or, just slap some tape or a sticker over the webcam, it’s decidedly low tech but perhaps equally as effective. Do you tape your webcam? Do you think this is all overly paranoid? Let us know your thoughts or approach to in the comments. I don’t see the point, but I run a Mac with a clean house, no sketchy software, and I use FaceTime all the time anyway. That should actually be “somebody’s”, but anyway…I agree with you that it’s nonsense if you keep your computer clean. No this is silly. Shouldn’t you tape your iPhone camera too if you are this concerned? Been doing Just the same on all Laptops be it Power book or MacBook or iPod touch. No need for someone to see me! 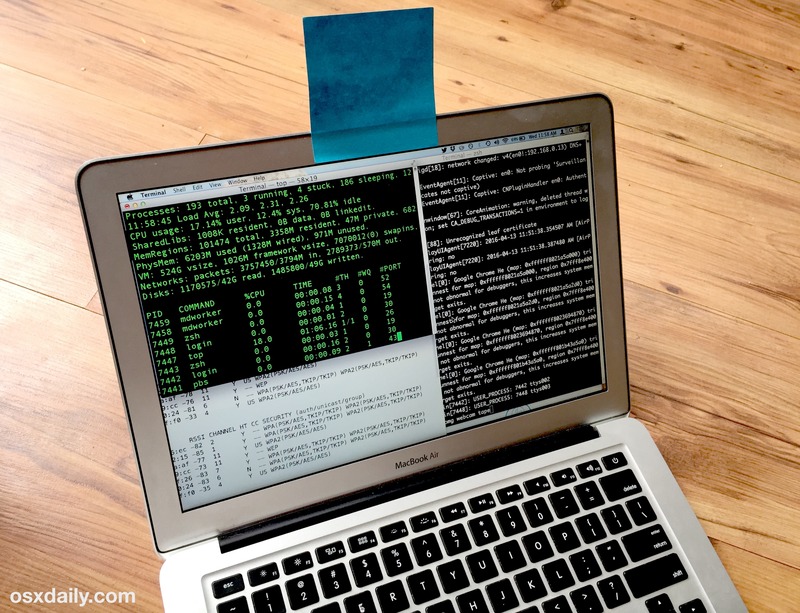 I tape mine, but it’s not because I’m paranoid someone is going to haxxor my Mac and watch me. It’s because I teleconf/IM a lot for work and don’t want to click the Video button by mistake while not paying attention on Lync/Webex/etc. This is exactly why I have a piece of paper over mine too, it’s the lip of an envelope I can pull on and off over the web camera anytime as needed. I have accidentally enabled the webcam a few times, and accidentally answered FaceTime calls a few times when they pop-up on the Mac (disable that stuff if it happens to you, notifications are annoying anyway!). Learned that lesson, put paper over the camera. Considering that the FBI Director’s rationale is basically “monkey see, monkey do”, I’m going to go out on a limb and say, Nah. I put tape over my iMac camera because I can. I don’t need to see the people I talk with. Putting tape over your iMac’s camera prevents others from seeing you, not you from seeing them. Earth to Vincent come in please. I painted over mine with silver paint and blocked the mic holes with the same paint pen. I bought a pentalobe screwdriver. I plan on disconnecting the camera internally when I bother to get around to it. Only my iPhone has a servicable camera. I have no reason to have a camera on my laptop. My employer does not allow them. Additional, cameras on laptops are a solution without a problem that needed fixing. They create a potential problem in and of themselves. Covering the camera is akin to closing a window on a potentially rainy day. Closing the window is easier than running home in the rain to close the window. Are you and Vincent/Jude related? Just a Gulf War veteran. I worked in security before that. After the military I started working in IT. I have been doing so since 1996. Everyone I know who works in IT keeps thier cameras covered. Ever think that a Hacker/crook can casy your Home or office for a robbery? It is TRUE! This is dumb. Why have a webcam if you’re going to cover it up? I’ll take the risk. Why not just get yourself a tinfoil hat too? “Why have a webcam if you’re going to cover it up?”. We are not given a choice. All laptops come with a webcam. We do not get the option to “vote with out wallets” because the “ballot” has only one choice. Tape, paint, hacks, or physical removal of the camera are the only options. Not everyone is allowed cameras in the workplace. Not everyone wants a camera in our face all day long. Another answer: You may want to use it some of the time, but you don’t want to run the risk of being camfected. “Thwart hostile adversaries and frustrate peepers with EFF’s Laptop Camera Covers! Say goodbye to that unsightly sticky note/masking tape/nectarine sticker guarding your machine. This handsome set includes three 0.5″ X 0.75″ and two 0.5″ X 1″ adhesive stickers designed to help protect you from visual surveillance by covering the lens of your laptop camera (and other devices) until you’re ready to use it! Every shop order helps EFF fight unlawful surveillance. I know this is somewhat facetious, but I can tell you that some apps absolutely DO activate the microphone without the user approving or specifically allowing it. They just turn on the microphone and start to listen. Some “Smart TV” hardware does this too. Obviously Hey Siri listens all the time, and so does OK Google and Amazon Alexa Echo. Maybe it’s a web browser, I don’t know, but this has happened more times than to be a simple coincidence. Even with obscure topics! Pay attention, you may notice it too… weird, kind of creepy. Would rather it not happen at all! It could be your computer, it could be an app, or it could be your TV that is picking up your conversation, then delivering that data to another source. This is common. Many new TVs actually WATCH and LISTEN to you as you watch TV. How many consumers know that? Privacy is hard to come by these days. People willingly sacrifice and give up their privacy to services like Facebook. Big Brother is Big Corporation, and you are the product. I have heard of this scenario recently also, it was enough to hit a news report about it. Several people have reported that they were having a casual conversation about something and not long after were bombarded with ads on that same subject, they just made it obvious they were listening, dispite denying they were, but what about those who leave no clues of ads on the subject you were simply talking about and who have already listened in on your conversation to whomever with the mic from your phone…??? What’s the best way to disable the iPhone FaceTime camera, temporarily and permanently? The camera is located very close to the speaker and to the sensors. Maybe a dab of black epoxy could act as a permanent solution while a thinly sliced peice of electrical tape might work well temporarily. On my iPhone I’d like a good solid temporary solution. But on my iPads I might go for a permanent solution. I don’t see how a real permanent solution can be anything other than opening the device and disconnecting it. However on small iOS devices that may be fatal if not impossible. By that I mean, aren’t they soldered to the board? Whereas a MacBook Pro has wires that can be clipped. Is that correct? I don’t own a laptop. Yep. Been covering the camera since before I converted to Apple. Some occasional paranoia is not a bad thing these days. I painted my camera over within hours of un-boxing my mac book. I have seen several people in IT security who paint over their camera, microphone, and paint the screws on their laptops too. I did paint over my camera, and microphone. I do work in IT and security. I have sensitive information all over my desk. I have three different cards that I have to wave over sensors just to get to my desk. It hardly makes sense to leave open cameras in the place. If you get to that point that you have to place a tape over your cam, you might just as well do a clean install of your system and call it a day. Manual backups is not hard. This way you don’t have to rely on the system that it will backup something that you don’t intend to. I have a hello kitty adhesive page marker over my camera on work laptop. Nothing over my MacBook Pro. Why did you thin out the MBP in the image? Like why even bother? Anyway, I sometimes tape my camera, sometimes I don’t. Depends on if I forget to or not really. I use the camera as well for video chat however. I’m not that worried about it, but after seeing enough people do it, I started to as well. Kind of like our friend quoted by NPR, you see something and think hey, maybe there is something to that. Roughly six or seven years ago, with screen-weary eyes, I clicked a link in search results to a map of the South China Sea. Realized too late it directed to a pdf rather than a website. The pdf loaded before I could react. The file was later attributed to the Chinese government by security researchers. It took control of the webcam on my MacBook 4,1 running Snow Leopard and started taking shots at irregular intervals. You could hear the system sound, the same camera shutter sound you would have normally heard from Photo Booth, with each shot. I graded and paved the hard drive (read wiped, reformatted and reinstalled the os and applications) and moved on. I keep things buttoned-up tight but a split second of bleary-eyed stupidity on my part was all it took. Just a “head’s-up” for everyone that we aren’t invulnerable. If anything, would think such exploits to be more numerous and executed with more sophistication than six or seven years ago. That is pretty crazy, particularly in Mac OS X 10.6 which many people consider very secure (because of it being the last true Jobs Mac OS). Was it Firefox? You better believe the sophistication is much higher at this point then. I think some software is bugged to begin with, which is why I think people are absolutely nuts to trust the jailbreaks, many of which are coming out of weird sources. You want to install some sketchy software from China onto MY iPhone? I don’t think so! How tightly linked are the camera and the indicator LED? Is it easy for the camera to be activated without the LED turning on? If Apple has done a good job of linking them, I would tend to lower the caution level a few notches. Not sure if you can see comment above (pending moderation) but my system running 10.6 was compromised. The LED was not activated. That being said, my webcam is not covered at present. Agree we should not ratchet-up the caution level. In the end, it’s up to individuals and organizations to gauge their threat tolerance and act accordingly. I duct tape my face at the beginning of the day, so I don’t have to watch out for someone accessing my camera. After investigating possible solutions, I came across an application which serves the purpose. “Micro Snitch”. LOVE IT! Who cares… I mean what a pervert will be watching you, if you are just a user at home or cafe?.. Maybe you should reconsider the piece of tape over the camera on your Mac one more time…. On a Mac computer the white LED next to the camera is serial connected to the power supply of the camera. This means that if the camera by any reason is turned on by someone – then the LED will light up and you know someone is watching you. If the LED is not turned on – the camera is in passive state as it get no current (power). It is not possible to watch you trying to utilize a passive camera, this is simply not possible. Wanna try again. The LED is connected between 3.3v and the active low camera enable. The camera always has power. The well publicized attack on macbooks was a trick that allowed the camera to operate even if the enable is set high (inactive). The Adobe flash exploit allowed the camera to take quick snaps yet the LED was only on momentarily. Unless you are sitting in near darkness, you would not notice the LED if it is only switched on for a few dozen milliseconds. I think you should see the 60 Minutes piece that they aired last Sunday. They showed a cell phone’s cam being hacked into. The cam’s light did NOT come on, but yet the hacker could see everything that the reporter was doing. Here’s the link to the report (if you’re interested). I have been covering the webcam on my laptop and my Grandchildren for about 7 years after seeing someone access the webcam on a colleagues laptop. Where exactly is the camera on your grandchildren Steve? I’ve always been a fan of removing the “AppleCameraInterface” and “Apple_iSight” kexts. Only way I’ve found to effectively disable the camera in software. I am not to worried about the security if OS-X. I run Linux on my macbook air. Me? 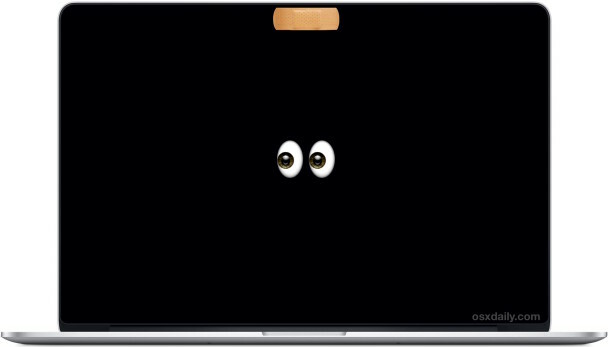 (Running A Mac) – I’ve YET to actually SEE someone run a web-cam (or phone cam) withOUT the LED going on. If someone shows me, then I’ll consider ruining my case with that sticky crap from tape, let alone leave that residue all over the lens. You sound a bit smug. This will wipe that smug off your mug….. There have been numerious cases where the camera was operated without the LED turning on, or without the LED being turned on long enough for the operator to take motice. The anode of the LED is connected to 3.3v. The cathode is connected to the active low enable on the camera. In thoery if the camera enable is high the LED is off, and the camera is in low power sleep mode. If the camera enable goes low, the LED is will be on, and the camera will be awake. However in some cases the camera can be operated with the enable left high. In the case of the pre 2008 macbook doing so was trivial. Granted the attacker needed high level access to modify the firmware on the camera. There was an all too well known Adobe flash exploit that could snap photographs quickly enough that you would not notice the LED. I love phrases like “there have been numerous cases” completely unsupported nonsense, a bit like my other favourite “a recent survey revealed that”. followed by more nonsense. I think Phred is just a wee bit paranoid, it’s OK Phred you can come in now the voltage thingy is below 3.3 on the Richter scale and there is no precipitation forecast. Just do a simple google search yourself. There are hundreds of reported cases. Blackshades was a Windows only exploit. This discussion is in the context of things Apple. For a couple of years I have used the “Camera Lock” software from Qneo on the app store, along with his other app; “Microphone lock”. They work perfectly and start as soon as you boot up and of course you can turn one or the other off at any time for quick access. This has been discussed a few years ago. Although, Apple THOUGHT they had tied the light to the camera, the camera HAS BEEN USED WITHOUT THE LIGHT GOING ON. There where a NUMBER of apple website articles about it. I’m surprised none of you read any of them. But then, it’s NOT like the federal government records our phone calls and then denies it, then admit ONLY “meta” data, then we learn they ARE recording our phone calls – and THEN give us the whole “who wants to see YOU?” routine that SO many of us out there FALL for AND preach. I forgot who said it. IF a cop followed you driving for 500 miles he could EASILY ticket nearly EVERYONE numerous times. But, hey, don’t worry about people watching you. It’s NOT like it’s…..oh, it IS happening. Boston civil-liberties lawyer Harvey Silverglate calls his new book “Three Felonies a Day,” referring to the number of crimes he estimates the average American now unwittingly commits because of vague laws. New technology adds its own complexity, making innocent activity potentially criminal. Trust no one when it comes to your privacy. Tape ’em up, I say. If you are a 007 agent, terrorist, criminal, tape your camera. If not the chances of anyone wanting to look at your ugly mug is null, zero, zilch, nada. If someone wants to watch you there are plenty of other easier methods then trying to hack into your firewall, hack into your OS, hack into your camera to look at you. I would think there would have to be a really important reason to want to go to such extremes to look at you and 99% of us aren’t that important including myself. Tell that to Cassedy Wolf. She is not an MI6 agent. I have a “trophy” Burmese wife. She does not care to have teenage boys watching her. I painted over the camera because I have no use for it, and I rather not leave the “door” open. I do not have any apps that use the camera. I run Centos Linux on my mac (no Facetime, no Quicktime, etc). Watch and vomit – camera hijackers! I kept a post-it over my camera for so long, when I finally peeled it off it left residue. Read, not only about how the camera LED can be disabled, but about how the camera can allow a virtual machine escape. fun note: didn’t want an xbone because of forced kinect. friend got one, got kinect separately, had NO idea it was picking up all his conversations until a few years later when i play killer instinct with him and call him on the phone to announce “dude you know i can hear everything going on right? yeah i can hear you talking. i dunno i think you have everyone muted, but you’re not muted.”. we’re talking years of gameplay, his kid and wife included, all broadcast. his own fault, but doesn’t invalidate my point that you’d be ignorant of this kind of breach. disabling a camera won’t work. the entire point is they’ll activate it remotely, so clearly they’ve gotten around that. You have as much chance of being watched as being killed in a terrorist attack. why even worry about it. The fact remains that vendors are irresponsible. How hard could it be for venders like Dell to offer a means to disable the camera in BIOS? It is irresponcible of Apple not to provide some simular means. For now paint does the trick. Yes; I cover my camera on my laptop. I also cover the camera on my Xbox Kinect. I do this because if I accidentally turn-on my camera, I don’t want to be embarrassed by what’s going on. My laptop is open all the time, usually in my bedroom. My Xbox is in my living room. I do Skype & Facetime, so I do like having the cameras available on my devices. As for my phone, it’s in a case that covers up the front-facing camera. The phone is usually in my purse when I’m not using it (which is zipped up all the time), so I’m not worried about its camera. A friend of mine published his webcam IP address but had it mounted in the center of the seat of his chair, facing up. I really do not care about the FBI knowing stuff about me. I am not “interesting” enough to be watched. I am a Buddhist pacifist with no ties to anyone of interest to them. Anyone who would be assigned to watch me would be bored beyond belief. I do not want my info open to identity theft. I do not want my wife to feel uncomfortable wearing a bathrobe in front of the computer. I think we as a society today are being over paranoid about everything these days. Yes with the invention of the internet we have to be a little more paranoid then we did in the 70s or 80s but come on seriously I am a YouTuber (mjsiebolt.ca) with over 2,000 videos and I don’t worry about anything online and even if something does happen to me I will take care of it no matter how much work it takes. Just cause the director of the FBI tapes his camera does not mean we have to. I live in a 1978 trailer “someone” got in, this place comes apart easier than it when it got put together and got all my information on both my iPhone and iPad! Couldn’t figure out how “they” KNEW when I was sleeping! Googled it! Then they also took control of my 2 devices deleteing photos as I watched but everyone tells me “I’ve” done something because all this is highly or totally impossible! I don’t feel safe!!! I used the same paint marker to plug the mic holes (the one I used to “blind” the camera). I bought the pentalobe tool to open the case. Later I will simply cut out the mic with my diagnal pliers, and pull the cable from the camera. Local companies charge $200 for the service. I run Linux on my macbook most of the time. I deleted all the useless OS-X apps like face-time, photobooth, QuickTime, etc. I am a serious computer user. My computer is not a “toy”. I bought it because it is compact, not because Apple is worthy of anything. Yesterday, i disconnected the ribbon cables leading to the camera and microphones. In addition, they are painted over with matching silver paint. Now I can open the “device info” utility and show security the “no camera found” message. My macbook can now be used in secure areas in compliance with local policy. Mark Zuckerberg also tapes his webcam. A lot of people do, so maybe there is something to it? It’s obviously unlikely that you will be a victim of snooping and hacking, but with the amount of junkware and spyware going around, it could be a reasonable precaution if you are concerned about some spyware creeping on you. If you do not use the camera, why leave it “open”? I’d like to point out that, if someone has the skill & ability to activate and remotely watch a web cam, then they probably can access a lot more than just the webcam. If your webcam is hacked, then your entire computer is suspect and should be shredded and recycled. Expanding on it a bit, what in the world is the IT of the FBI doing issuing laptops to anyone on staff, never mind the director, laptops with the webcam and microphone enabled? OMG ever since I saw this i put tape over all my cameras, including my phone!